Freedom. That is why Alexa Stone drives a truck. “What other job is there where you get up, walk 3 feet to work, listen to music all day while seeing the beauty of nature, take a nap when you feel the need, have near total control over any negativity getting into your world… and get paid for it?” she said. Alexa joined TransAm Trucking in May 2017, and we are sure glad she did. At a young age, Alexa Stone began driving as a building materials delivery driver, running 30,000 GVWE straight trucks. She then moved up to a tractor-trailer in 1996. 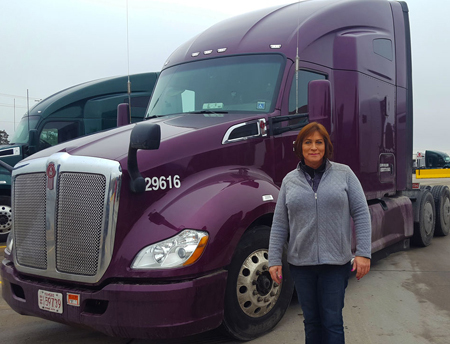 She taught herself how to drive a CMV, pass a CDL exam, and how to be successful on the road. Then Alexa took a break from truck driving and worked in the corporate world as a General Manager. After 15 years in that role, she was ready for a break from constant phone calls and dealing with difficult retail customers. In 2015, she found her way back to a big rig. Between drive shifts, Alexa takes care of any business concerns then relaxes by meditating or watching DirecTV. She also started carrying a fold-up alpine climber with her to get exercise during breaks. Alexa believes that mindfulness is one of the most important aspects of being a great driver. “Concentrate on what you are doing and always do your best. Your success, as well as the safety of yourself and the public, relies on you being mindful of what you are doing at all times,” she said. It is evident that Alexa has a lot of knowledge as a truck driver. She even helps moderate a driver-run Facebook group where drivers exchange stories and ask questions about their profession. Her positivity and willingness to help truly exemplify our noble purpose. Thank you Alexa, for choosing to contract with TransAm Trucking!